Looks Great and a Life-Saver to Boot! Having difficulty fiddling with tiny clasps and hooks and springs? Then magnetic clasps will put a big smile on your face and keep you fashionable all at the same time. Magnetic-clasps are a relatively recent innovation but they are making massive headway into the hearts of jewellers - artisans and wearers - alike. The ease-of-use of the magnetic clasp enables everyone including elderly people, sufferers of arthritis, or those with painful fingers to adorn their jewelry easily and effortlessly. A magnetic fastener consists of 2 pieces of magnets in the clasp which literally spring together to 'fasten' that piece of necklace or bracelet. 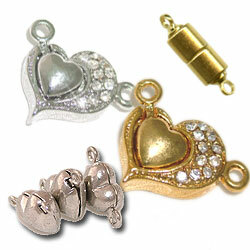 Normally the magnets are fairly strong which ensures that the jewelry piece will not come apart easily or accidentally. As its popularity grows, the manufacturers and supplies of these clasps have come up with more and more innovative and beautiful designs. They are no longer just functional but are sometimes so beautifully designed that they can form part of the integral beauty of a created piece. Do not just pull the magnets apart when opening a magnetic clasp. This will weaken the magnets over time. Rather, open the clasp as if you were snapping a piece of pretzel. It has been long believed by many and studies have also shown that magnets may be therapeutic. They may be effective in alleviating pain and discomfort in the hands and body. However magnetic findings &/or beads are not intended to be sold as medical devices nor are they meant to replace/supplemnt a doctor's care or prescribed treatment. You should never use magnets if you are pregnant, wearing a pacemaker, defibrillator, or any other implanted electro-medical device. Keep magnets away from computer disks, monitors, videotapes, cassette tapes, and credit cards as the magnetic fields can interfere with or damage suce devices. "Clever Clasps" as aired on television, are a form of magnetic clasps. However some customers, though finding the Clever Clasps to be effective, have also found them to be overly heavy or bulky. There are many other magnetic clasps that are coming on the market that do not have that bulk problem but instead can offer a whole range of styles, colours, finishes, and shapes.